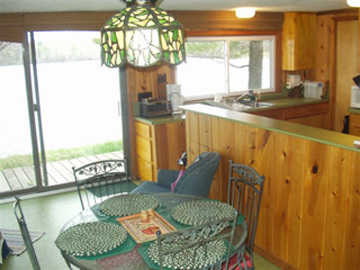 The cottage is nicely situated with wooded Lakeshore land behind us and across Long Lake. We are blessed with a quiet Lake and quiet neighbors, with enough trees to afford a lot of privacy. 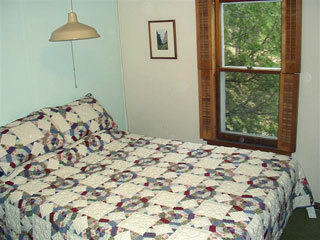 The cottage has one bedroom with a queen bed and good storage space. There is a small extra sleeping room, which we call the Nest. It is only large enough to hold the queen sized bed and has a view of the lake. 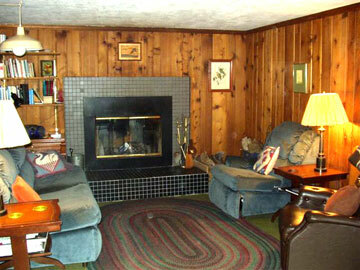 This cottage is the perfect size for a small family, a couple, or 2-4 good friends. Any number of overnight guests beyond 4 must be OK’d by us and may require an additional fee. See floor plan. The living room, dining room, and kitchen are an open floor plan, anchored at one end by a fireplace for heat and ambience and on the other end by a sliding glass door and windows overlooking the lake. The bathroom has a shower/tub. The cottage is supplied by highly rated well water, but for taste some people prefer bottled water. Ursa Minor can be rented from early spring through late fall. For Rental information, please visit the Rental and Contact Page. Our fully equipped kitchen includes a microwave, blender, coffee maker, mixer and toaster oven, but no dishwasher or disposer. Bed linens and pillows are provided. For summer use, we have a rowboat and accessories, lawn chairs, and a Weber Grill. Charcoal is provided. We also have a washer/dryer, radio/CD player, VCR and a small TV. No cable or ISP available. Good cellphone reception, so can access internet through those phones that allow it. If you prefer not to cook, the locally famous Manitou Restaurant is within a 3/4 mile walk. No smoking! Dogs are welcome, with the expectation that the owner cleans up after them and assumes responsibility for the cost of any damage. Unfortunately, cats are not permitted, due to cat allergies. 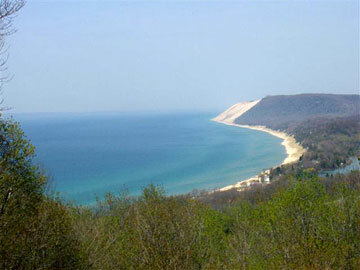 You will need to bring towels, a flashlight ( if arriving by night), food for your visit. Cell phone reception is good. Guests are responsible for cleaning the cottage. We have a manager, who will check in on Fridays during turnover and pick up the keys. We have no garbage service, so your garbage must be carried away with you when you leave. There is a system to make use of garbage service during week-long stays.